"Cold Souls" suffers from the inevitable comparisons it will draw to the far-superior "Being John Malkovich" and "Eternal Sunshine Of The Spotless Mind." It so closely resembles the films of the Charlie Kaufman universe in both tone and subject matter that it might have been called "Being Paul Giamatti", although writer/director Sophie Barthes' work never reaches the apex of wit or imagination that is on display in Kaufman's collaborations with Spike Jonze and Michel Gondy. We may be wading through the same thematic waters here, but our tour guide has fewer insights. It's a very pretty film. Cinematographer and producer Andrij Parekh shares Barthes' "a film by" credit, and the muted colour and dreamy, floating camera work are exquisite, but the narrative plays it safe, skirting the more challenging elements of its great premise. Echoing (or ripping off) Malkovich's brilliant casting of celebrity-as-self, Barthes tells the tale of "Paul Giamatti", a famous American actor struggling through rehearsals for a new stage performance of Chekhov's Uncle Vanya until he stumbles across a New Yorker article on Soul Storage, which promises "relief from the burden of the soul". 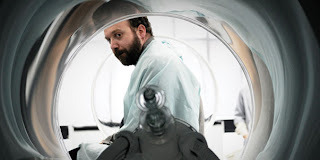 Believing he has found the solution to his professional crisis, Giamatti visits the lab and is convinced by David Strathairn as Dr. Flintstein, seemingly channeling Tom Wilkinson's performance from Eternal Sunshine. The actor undergoes the soul extraction procedure and his "essence", the film points out repeatedly, looks remarkably like a chick pea. Given the choice of selecting a replacement, Giamatti opts to go soulless, which has some comic consequences. After a very funny sequence where he performs "Vanya" with a cheerful enthusiasm hilariously innapropriate for Chekhov, baffling his director and fellow actors, he is unable to make love to his wife (Emily Watson, criminally underused)and so he returns to the lab to get his soul back, only to discover it has been lost in storage. Flinstein assures the distraught thespian that the missing soul has most likely been sent to the New Jersey warehouse by mistake. Actually it has already been smuggled out of the country and peddled on the black-market by Nina, a mysterious "soul mule". It is worth noting that "Paul Giammati" is not Paul Giammati's greatest role. As a leading man, he peaked with "Sideways" and "American Splendor", and has been trading on the good-will those pictures generated with audiences ever since. Consider his cringe-worthy work in "Cinderella Man" or "Lady In The Water" as evidence of his decline. This may be among the best of the dopey, maladroit, misfits he has brought to the screen, but it is nothing you haven't already seen him do, and making the actor the hero instead of giving him a character to play is the fatal design flaw of the narrative. If you have ever seen Robert De Niro give an interview, you will know it's not exactly "Raging Bull". Giamatti might have made a great "Kaufman" if Nicholas Cage hadn't already nailed the part in "Adaptation", but his "Giamatti", another beehive of neuroses, gets old pretty quick. The film sparks to life however whenever it shifts focus to Russian actress Dina Korzun as "Nina", the reluctant trafficker who has smuggled Giamatti's soul into Russia, where it has now been sold to a TV soap actress who really would have preferred Al Pacino's soul. Korzun has one of the great poker-faces to grace the screen in some time and her blank stare manages to simultaneously convey both a mechanical detachment and a deep, melancholic longing. Denied a romantic leading man here, I couldn't help but wonder how she might fare opposite someone like George Clooney or Clive Owen. I hope we see more of her in American movies. In the end, the film is less about the metaphysical and existential dilemmas inherent in its set up and more of a "golden fleece" tale of a man literally searching for his soul, a plot that works better as metaphor. Remember Robin William's turn in "What Dreams May Come"? Probably not. You're better off renting Malkovich on DVD. Make it a double bill with Eternal Sunshine. Alan, your third paragraph makes me wonder if perhaps you could see "John Adams" as Giamatti's Raging Bull moment? Not quite the biggest stretch ever for him but he does manage to disappear quite well into the character. My colleague Reece wrote this piece. I haven't seen either Cold Souls or John Adams yet - Adams is on my list of TV shows to see though that's for sure. Sorry Reece! I really do need to read closer; that's like the 3rd time I've done that. Mark, to be fair to Mr. Giamatti, I will definitely see John Adams. There is no arm-twisting necessary when the lovely Laura Linney is involved.